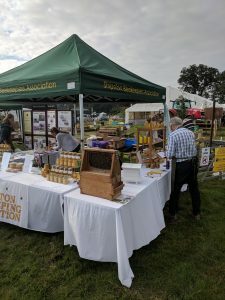 We had a wonderful time at Moreton-in-Marsh Agricultural Show! Enrolment for our April course is now open! The SBKA has officially attended Cherington, Brailes and Tysoe village shows with the SBKA gazebo. 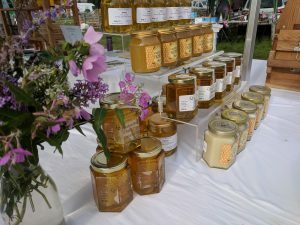 We sold some honey (and with 50p per sale going to the club, helped our funds! 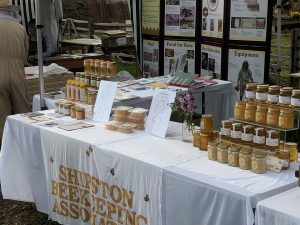 ), but more importantly these shows served a great educational role, talking to members of the public about bees. We took the observation hive to Brailes and Tysoe, which went down really well! Cherington, ready for our first customers! The observation hive was a star of Brailes show. 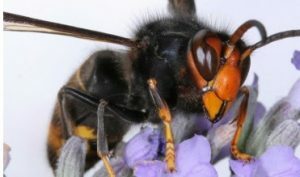 The National Bee Unit has confirmed a sighting of the Asian hornet in the Tetbury area of Gloucestershire – the first time the hornet has been discovered in the UK. The Asian hornet is smaller than our native hornet and poses no greater risk to human health than a bee. However, they do pose a risk to honey bees. We have been anticipating the arrival of the Asian hornet for some years and have a well-established protocol in place to eradicate them and control any potential spread. 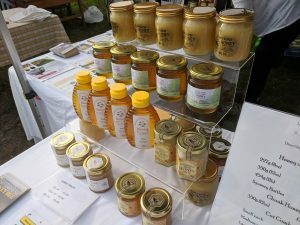 It is important to remember they pose no greater risk to human health than a bee, though we recognise the damage they can cause to honey bee colonies. That’s why we are taking swift and robust action to identify and destroy any nests. We remain vigilant across the country, working closely with the National Bee Unit and their nationwide network of bee inspectors. A local control centre will be opened tomorrow near Tetbury and bee inspectors from around England will be closely monitoring a three mile radius around the initial sighting. They will be supported by nest disposal experts who will use an approved pesticide to destroy any hornets and remove any nests. 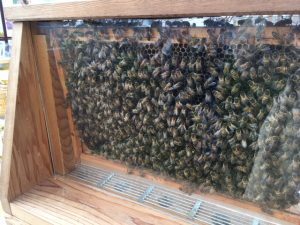 The hornet found in Tetbury is currently undergoing DNA testing at the National Bee Unit in North Yorkshire to help establish how it arrived in the UK. The hornet arrived in France in 2004 and is now common across large areas of Europe. It was discovered for the first time in Jersey and Alderney this summer. It is believed the species will not be able survive in the north of the UK due to colder winters. 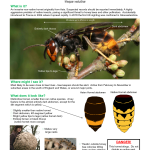 Asian hornet poster which are available for identification purposes. You can also find very useful instructions for how to make a trap: Monitoring Trap. Experience in France suggests 70% reduction from using these. 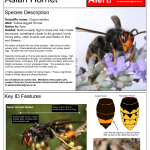 Any suspected Asian hornet sightings should be reported to alertnonnative@ceh.ac.uk . When emailing, please include your name, the location of the sighting and if possible, a photograph of the hornet. Please do not put yourself in any danger of getting stung when trying to take a photo. BeeConnected, the new web-based communication system between farmers and beekeepers is now open to all beekeepers to register and to receive alerts from local farmers of insecticide spraying events. BeeConnected is a nationwide initiative that provides a more efficient and effective way for farmers to inform beekeepers of their intention to apply an insecticide. In addition to receiving accurate and up to date information of a spray event happening in the area BeeConnected provides direct contact from local farmers and provides the opportunity to establish a relationship with local farmers. BeeConnected in a joint venture under the Voluntarily Initiative between the BBKA, National Farmers Union and Crop Protection Association. Margery Blower is currently designing the SBKA roller banner (also known as a pop-up banner) for Association use at events and shows. We know our members take some fantastic photographs, and we’d love to showcase your talents on the banner. Please submit your high-resolution, bee and bee-keeping related digital photographs to Margery. The queen has not been laying for a couple of months, but she now begins to deposit the first few eggs in cells in the warmest part of the cluster. It is too cold for the hives to be opened, but there are things to look for in the apiary. Check to see wind or animals have not overturned the hives. If they are overturned, reassemble the hives and give them a feed on top of the frames. Check for woodpecker damage, woodpeckers can be deterred with small mesh wire or polythene sacks wrapped around the hives. Check floor for signs of a mouse getting into the hive, such as large pieces of wax on the ground at the hive entrance. Check the varroa screen below the brood box for fallen varroa. See DEFRA leaflet “Managing Varroa” for treatment with oxalic acid. Review the hive positions re sun and wind; this can be a good time to move a hive within the apiary. There are a few jobs that can be done in the shed. Make up frames, but leave the wax fitting until March. Clean the smoker and queen excluders. Clean old frames: buy a wax scraper/remover for the frame sides, or use an old tea urn to boil them clean. Blowlamp your spare solid floors (which should have been replaced by varroa screen floors), spare cover boards, empty supers and spare brood boxes. You need 50% more equipment than you have as occupied hives. A spare brood box for every two occupied hives (for artificial swarming or shook swarms), and a nucleus hives (one for two hives) so you can remove the queen when required etc. Make up spare crown boards. clearer boards. dummy boards. Hive stands.